The popular Christmas carol concert under the wings of Concorde returns this year at Yeovilton’s Fleet Air Arm Museum on two evenings, Thursday 14th and Friday 15th December. “We are delighted to host the HMS Heron Royal Navy Volunteer Band for the third year running. Tickets are £15 each and include a mince pie and mulled wine on arrival. A bar and refreshments will also be available. 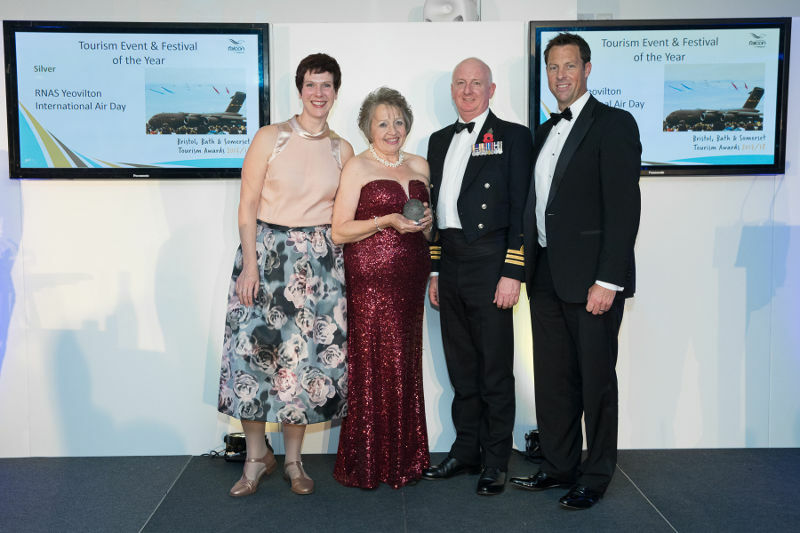 The RNAS Yeovilton International Air Day was recognised for its achievements with a Silver award in the Tourism Event of the Year category at the Bristol, Bath and Somerset Tourism Awards ceremony held at the Somerset County Cricket Club. After 6 months of assessing evidence and judging by a panel of experts the winners were announced by Laura Rawlings from BBC Radio Bristol and presented with their awards by ex-England cricketer Marcus Trescothick MBE. On behalf of the Air Day, Commander Terry Tyack (Commander Air, RNAS Yeovilton) and Audrey Huelin (AHA Events) received the award in front of a capacity audience of the best tourism businesses from across the region. “It is tremendous that Air Day has been recognised such a local thriving tourism industry. The success of the event is a combination of significant effort from a series of teams including AHA, the military, civil service and civilian contractors; it is an absolute pleasure to receive the award on their behalf,” said Commander Tyack. Audrey Huelin added, “Our Air Day is truly living up to its international status. Our Early bird tickets for next year’s Air Day, which takes place on Saturday 7th July, recently went on sale and within one hour we received ticket orders from Brazil and Japan!”. Early bird tickets for next summer’s Air Day are now on sale with no booking fees, for a limited period only, at www.royalnavy.mod.uk/yeovilton-airday. Old Buckenham Airfield is delighted to announce the opening, on Remembrance Sunday 2017, of its second Museum; the 8th Air Force Heritage Gallery. This new addition to the Airfield has been designed as a complement to the 2015built 453rd Bombardment Group Museum which houses the largest collection of 453rd memorabilia in existence. The new Gallery showcases some of the extensive collection of James Clarey. His collection, combined with that of the late Pat Ramm, is partly on display in the 453rd Museum, of which he is also Curator. 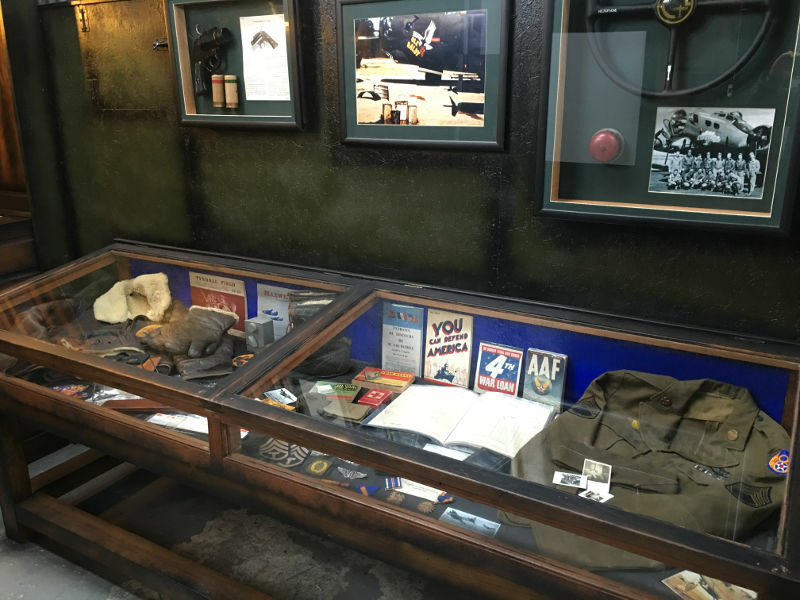 James, however, did not limit his collecting to the 453rd and has so many exhibits relating to the 8th Air Force (of which the 453rd was a part) that the decision was made to create the 8th Air Force Heritage Gallery, in order to provide a place where they can be on public display. Based in the Airfield’s ‘Small Blister Hangar’ the Gallery contains a host of displays and exhibits. At its heart is a faithful recreation of the Post Exchange which was a key feature of the lives of all the servicemen at Old Buckenham during the War. The Post Exchange, as the name suggests, was the place for parcels and letters to go back and forth between England and the U.S. and for most servicemen would have been the most tangible link with home. Post Exchanges also served as a shop and social centre on the base. Remembrance Sunday will also see the unveiling of a new ornamental railing enclosure for the Memorial Garden. Built in house by the airfield, the railings required over a thousand fixings and took over a week to complete. A brand new LED lighting system completes this latest update, the first major improvement since the Garden was created in 2012. Fittingly, the 8th Air Force Heritage Gallery will be formally opened following the traditional Remembrance Sunday Service, held at 1055 at the War Memorial. The United States will be represented by a senior officer from Lakenheath Air Base. RNAS Yeovilton International Air Day is delighted to announce the participation of two aircraft types from debuting nation Lithuania. The Baltic state’s air force will send an Aero L-39 Albatros jet trainer and a Mil Mi-8T utility helicopter for static display. Rarely seen at Western European events, they get Air Day’s international line-up off to the very best of starts. The remarkable Mil Mi-8 (NATO codenamed ‘Hip’) is the world’s most produced-helicopter: a staggering 17,000-plus examples of the Soviet-origin design having been manufactured. Lithuania only employs three Mi-8Ts (‘Hip-Cs’) in the troop transport and search and rescue roles. 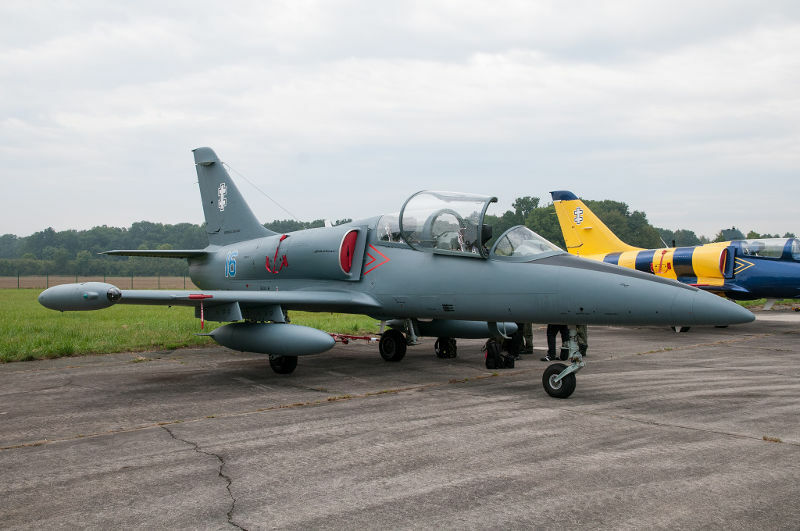 As the Lithuanian Air Force continues with their modernisation programme these assets are a very welcome addition to the Royal Navy’s air show at Royal Naval Air Station Yeovilton on Saturday 7 July. Early bird tickets with no booking fees are now on sale for a limited period only at www.royalnavy.mod.uk/yeovilton-airday.